In the United States there are more than sixty semi-pro, minor, or amateur football leagues with over nine hundred individual teams but each team is comprised entirely of male players. In a few short years the Women's Football Alliance (WFA) has grown to sixty-three teams, spanning over twenty-five states across the country. 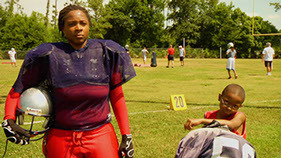 Making it the largest full-contact female football league in the world. One of the newest teams is the ORLANDO ANARCHY. This is their story. GRIDIRON GIRLS follows the day-to-day lives of a full-contact, all female football team. From tryouts through the end of their season, watch these women take a shot at a dream they’ve had since they were little girls. These athletes are under constant pressure not only to win, but to break down stereotypes of a sport dominated by men while trying to balance home and family life. Unlike most semi-pro teams, these determined women have a self-funded team. With no sponsorship money for equipment, they buy their gear with credit cards and borrowed money. Working extra shifts on their day jobs or having their kids do homework on the sidelines just for chance to demolish another lady on the field. Football is an aggressive sport and there is nothing timid about these women. They curse and fight, play with injuries and break their bones with one goal in mind: Championship. But it's not just "show up and play" for the women of the Anarchy, they own and run the team themselves. From recruiting new women who have “always wanted to play," to finding a new home field, to just having enough uninjured players to get through the fourth quarter. Every snap, every practice, every game becomes a struggle. The task of training this team of women rests on the shoulders of a all male coaching staff who treat them like men; pulling no punches and not willing to accept less than total commitment from these part-time players. 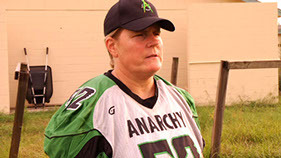 Off the field, the women of the Anarchy face the challenges of juggling a career, motherhood, relationships, with a physically rigorous sport. The injuries they face are real and potentially life threatening. Each person on the team will breakdown mentally and physically. They fight with their spouses, coaches, and other teammates till the fabric that binds them together is strained to a breaking point by the end of the season. Most women dread football season, GRIDIRON GIRLS live for it. Interested in checking out more of the ORLANDO ANARCHY? Interested in the WFA (Women’s Football Alliance)? 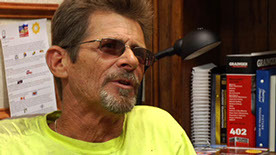 A master plumber by day and hot headed head coach of the Anarchy at night, he must take a group of inexperienced ladies and turn them into football players. He treats them like men; pulling no punches and not willing to accept any less than total commitment. 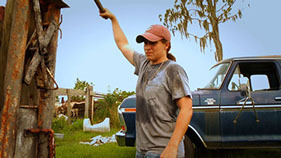 An innocent backwater farm girl who’s tough as nails on the field. Her down-home country outlook is always insightful and witty. After wrangling cows, and riding bulls, can going up against a 250 pound line-woman make her flinch? Yes, her name really is Lightning, it’s on her birth certificate. This Orlando Police officer is a born leader and strong role model on the team. But can she keep her head in the game after getting involved with the team's running back, Yahoo? This single mother is the most intimidating player on the field. Her teammates say she is “like a train that can’t be stopped.” But after having a serious injury that could end her career, is it wise for this single mom to go back on the field? A fiercely competitive wife pushes herself beyond her physical limit. Her husband, PATRICK, who helps out on the sidelines is concerned for her safety. Can her body, and marriage, survive the season? This professional athlete started playing sports to stay out of trouble. Having recently had a baby with her female partner, Brandi looks forward to having her son be the new “ball boy” for the team. This is the team’s girly-girl. She is also a wife and mother of two who continues to pursue her dream of being a athlete. Can this stay-at-home mom support both her family and her team? At 48 years old she’s the only one on the team with an AARP card. She is the rock that holds the girls together, and keeps things moving behind the scenes, but is she too old to keep playing?